Mix the first four ingredients together in a small bowl and chill for at least 30 minutes to blend flavors. Preheat broiler. 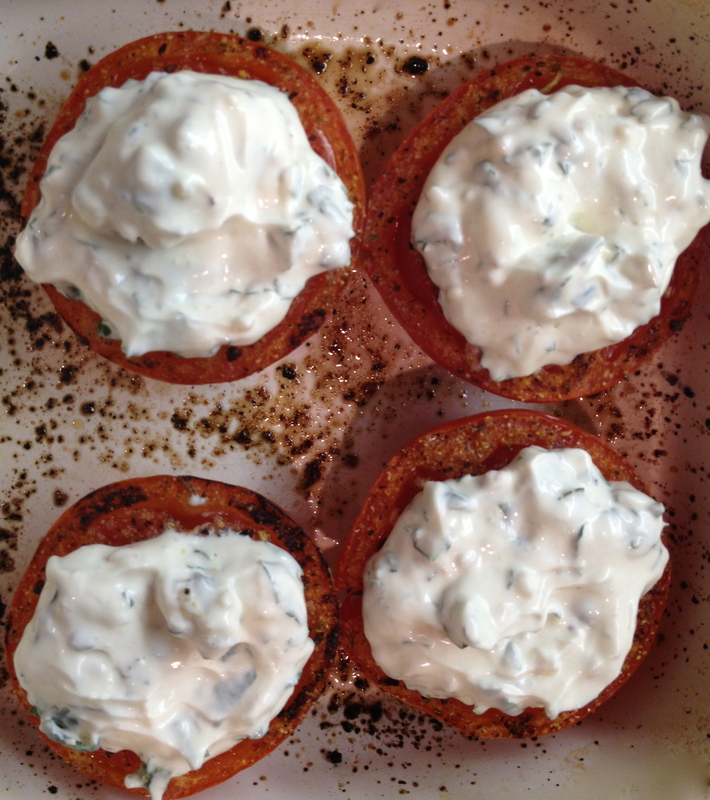 Cut tomatoes in half crosswise and place in a shallow baking dish, cut side up. Sprinkle tomatoes with salt and pepper to taste. Place dish on a rack about 3 inches from heat. Broil tomatoes for about 5 minutes, or until heated through, but still firm. Remove from broiler and top with cilantro cream sauce. Tante Z ( Aunt Zigrida) fled Latvia with her parents during World War II. Her vinaigrette dressing was a staple at family gatherings for many years. Family members often discussed taking the tasty dressing to market, and Tante Z’s nephew, Peter Skrodelis, and his wife Liz took up the challenge. They asked Tante Z to come up with additional flavors, so she created honey lemon and spicy versions to complement the original garlic dressing. The vinaigrettes are made with fresh ingredients, and contain no MSG or preservatives. We love these fresh and wholesome products! 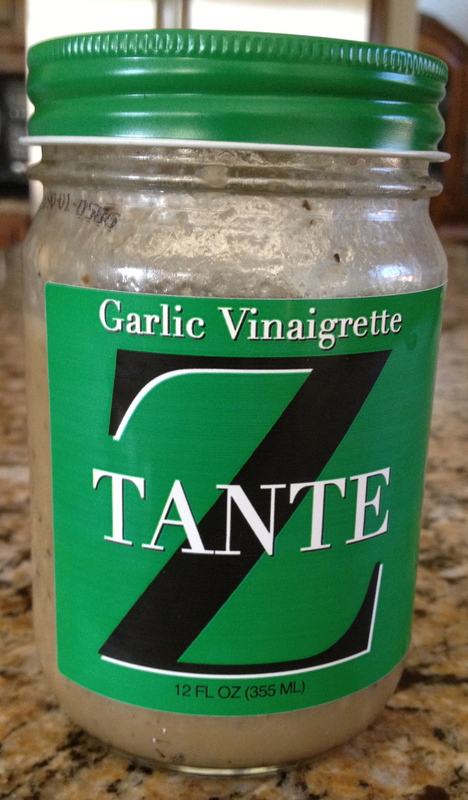 Tante Z’s website offers all three flavors for direct order and also provides a list of retailers who carry the vinaigrettes. Get creative with them in your own kitchen! For many people, meatloaf is the ultimate comfort food. I’m married to one of those people. Allen considers it a special treat to have meatloaf and mashed potatoes with peas, and there are few meals that are easier to get to the table. That means meatloaf is in regular rotation at our house. For variety, I use a couple of different recipes and sometimes I just wing it with my own concoction. J-Burger spiced up our burgers last fall, making them juicy and flavorful in a hurry. 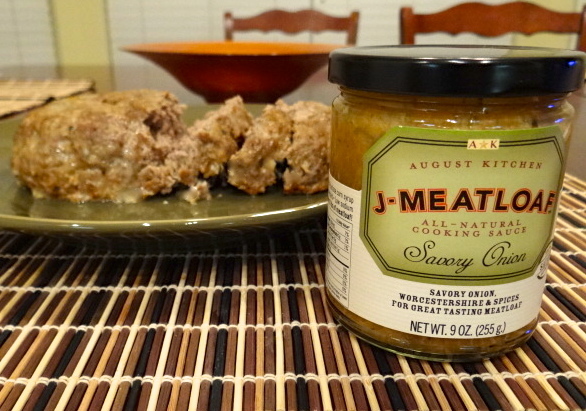 Its creators at August Kitchens alerted us to their J-Meatloaf seasoning, and we picked up a jar at Central Market. The ingredients are almost identical to the ones I use in my “recipe-free” version , so I knew the flavor profile would be familiar. I liked the convenience of the Worcestershire sauce, onions and spices being ready to go from the jar. (Time savings – woo-hoo!) I made August Kitchen’s recipe straight from the jar label and it was very good. The meatloaf was moist and the savory flavors were pleasing. It was a nice change of pace from the tomato-based sweet seasonings so common in Southern meat loaf, while still being in the comfort food zone. We loved it! Preheat oven to 325°. Mix all ingredients, form into a loaf, and place in a greased baking dish. Bake for about 45 minutes or until internal temperature reaches 155°. We found J-Meatloaf online. Keep it on hand for meatloaf magic! I really don’t make New Year’s resolutions, but I do keep a running list of things I’d like to do more, or in some cases, less. One of my “do more” things was to bake more bread. There are few foods I enjoy more than warm home-baked bread, and I have a couple of absolutely fool-proof recipes that I have used for a long time. About the time I was baking two loaves of bread last week, Allen told me he had decided to cut back on carbs. Hmmm…this should be interesting. So, now I have almost two loaves of bread in the freezer ready for toast, grilled cheese or sandwiches. If you have a food processor, you can make this bread with confidence. It has been perfect each time I have made it. Stir yeast and sugar in warm water until dissolved. Insert metal blade in food processor. Put flour, butter and salt in work bowl and process for 20 seconds. Combine yeast mixture with cold water. Turn on food processor and pour yeast mixture through the feed tube in a steady stream only as fast as the flour absorbs it. Continue processing until dough cleans inside of work bowl, then let machine run for 60 seconds to complete kneading. Remove dough from work bowl and shape into smooth ball. Place in lightly floured plastic storage bag. Squeeze out air and close end with wire twist, allowing space for dough to rise. (I use a zipper-lock bag.) Let rise until doubled, about 1 1/2 to 2 hours. Open bag and punch dough down in bag. Shape into loaf and place into greased 5-cup loaf pan. Cover with oiled plastic wrap and let rise in warm place until dough rises just above the top of the pan, about 3/4 hour. Bake on center rack of preheated 375° oven for 35 to 40 minutes. Remove from pan and cool on wire rack. 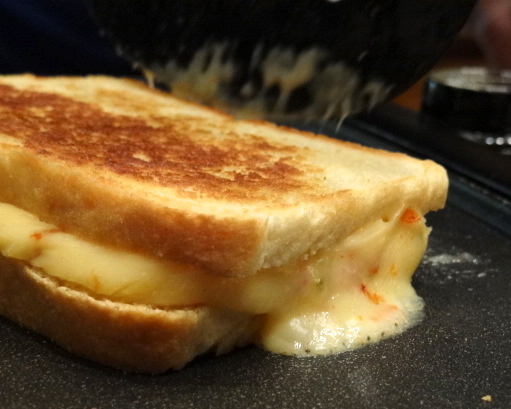 Yancey’s Fancy knocked our socks off with their smoked gouda process cheese, and when we shared the smoked gouda pimento cheese recipe on a previous post, we promised some more Yancey’s Fancy goodness to come. Enter jalapeño & peppadew cheese with a great combination of sweet & spicy. I had heard of peppadew peppers, but didn’t know much about them, and had never tasted one until recently. Peppadew peppers are apparently the first new fruit to be discovered since kiwis in the 1970’s. The small red fruit looks like a cross between a small pepper and cherry tomato, and was found growing in the Eastern Cape of South Africa. It occupies a “mild” position on the heat scale, and definitely has a hint of sweetness to it. 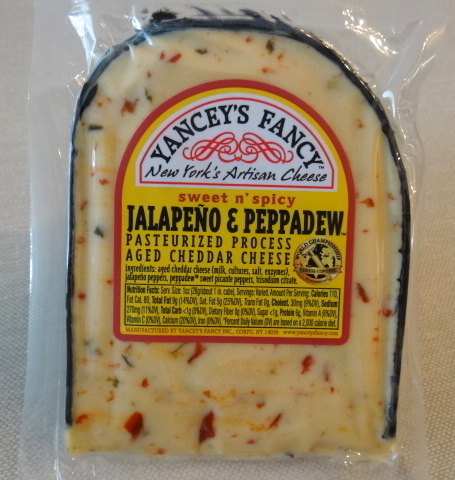 Yancey’s Fancy combined it with spicy jalapeños in creamy and delicious aged cheddar. The pepper combo yields just the right amount of heat and it seemed pretty perfect for a grilled cheese upgrade. Since I had plenty of homemade bread on hand, it was perfect timing. Try lightly brushing the bread with a small bit of olive oil before buttering, and grill it at a lower temperature to allow the cheese to melt completely. Yancey’s Fancy process cheese is made to melt smoothly and evenly, and my grilled cheese sandwich was simply awesome. I’m glad I have plenty of homemade bread in the freezer to make more! Our regular Costco shopping trip last weekend was interrupted by the sight of a feeding frenzy around one of the “road show” displays. For those of you who aren’t Costco shoppers, the store invites guest gourmet food vendors to set up sampling displays and offer their products for a few days. These events usually offer crazy good products for a really good price, so I’m always in line to see what is going on. In this case, cheerful workers were distributing cheese samples at lightning speed as they chatted with shoppers about mouth-watering recipe ideas. I popped a bite of Yancey’s Fancy Smoked Gouda into my mouth and immediately understood why people were stuffing cheese in their mouths as fast as they could! The pasteurized process cheese had a delicate, smoky flavor and a really creamy texture. Allen was just as impressed as I was, and so into the shopping cart it went. Process (or processed) cheese is a combination of natural cheese and emulsifiers which make it a very uniform product that melts smoothly. It is great for cooking because it doesn’t separate when heated for long time periods as natural cheese does. American cheese is a very popular process cheese that most people have eaten at one time or another. While you might not bust out a process cheese to serve on a cheese tray at your next dinner party (unless your guests are five-year-olds), I think it is a really good option for cooking, especially when it is as tasty as this smoked gouda. I immediately thought of the smoked gouda pimento cheese that Karen and I pick up from Market Street’s deli whenever she is in town. It is so good that sometimes I don’t wait until she comes to town! I had a quick and easy version of it mixed up in under 10 minutes, and was pleasantly surprised to find that Yancey’s Fancy had a firmer texture than some process cheese, so it was very easy to grate. Grate cheese and place in a medium mixing bowl. Add all other ingredients and blend well. Refrigerate at least 30 minutes before serving. Our delivery vehicle of choice for this savory pimento cheese was Primizie Crispbreads Smoked Dutch Gouda and Garlic flavor, which was the only flavor we hadn’t yet tasted. 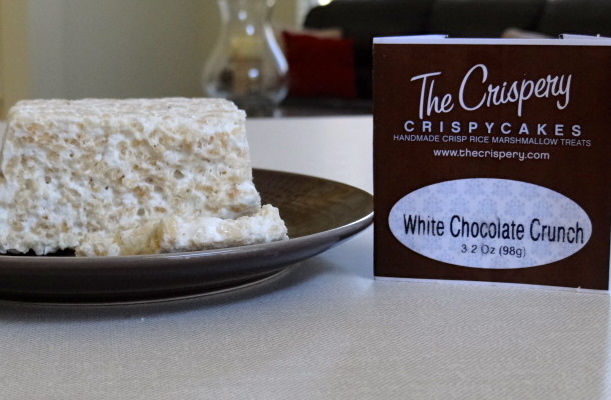 As with the other crispbreads, it was stellar. The combination made for a great contrast between super-crunchy and ultra-creamy, and the double gouda and garlic layers were almost too good for words. This duo should definitely have an addiction warning label attached! Yancey’s Fancy’s company roots go back to post-World War I New York, when Leo Kutter emigrated from Germany and began using his European cheese-making skills to produce Limburger cheese. Mr. Kutter left his business to his sons at his death in 1962. Richard and Tony Kutter partnered with master cheesemaker Brian Bailey in the mid-1990’s, who helped them expand their variety of cheeses. In 1998 when the Kutters retired, Mr. Bailey, John Yancey and Mike Wimble bought the business and Yancey’s Fancy was launched. If you are a Costco member, you should definitely check out the Yancey’s Fancy website for their roadshow schedule. If you aren’t a Costco member, you can order online directly from the website. We brought home two more flavors of Yancey’s Fancy cheese, and we will be sharing some recipe ideas soon! Kathleen King began her professional baking career at age 11, selling her chocolate chip cookies from a card table on her parent’s farm. By the time she was 21, she had her own bake shop in Southampton, New York. Kathleen’s focus is on traditional American desserts using recipes with natural ingredients. Her bake shop, named for her father, is a favorite with tourists and locals alike. Kathleen not only shares her baked goodies, but recipes in her cookbook, Baking for Friends. So right about now, you are saying “what about the cookies?” In a word, delicious! I admit that I’m a soft, chewy cookie fan. Yet, Kathleen won me over with crisp, very thin cookies. They really do melt in your mouth. They are buttery rich, with loads of white chocolate chips and macadamia nuts throughout. I had to try a couple, just to be absolutely sure that first wonderful cookie wasn’t an isolated case. I may keep testing…there are still cookies in the package! 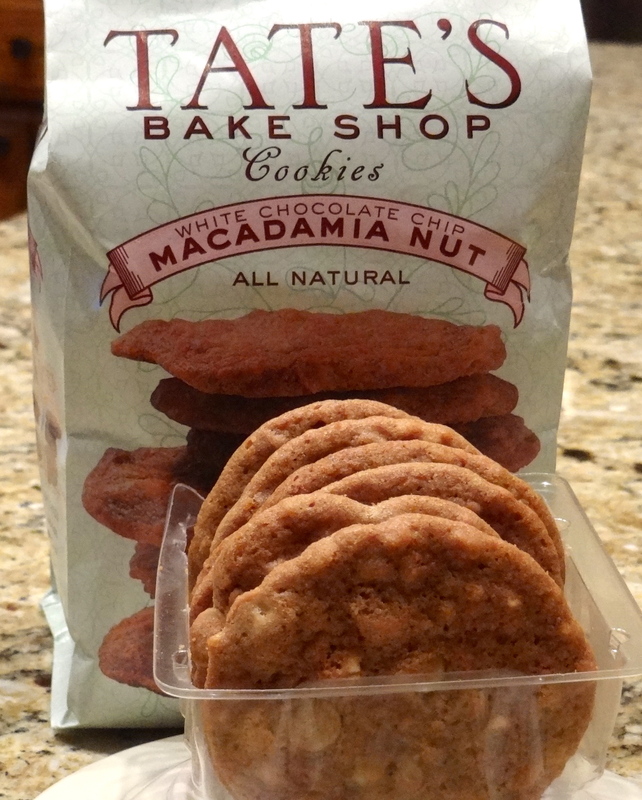 Tate’s Bake Shop has a very user-friendly website where you can order goodies by flavor, by product, by occasion or by price. Not only can you order cookies, but also pies, breakfast breads and bar cookies. There is also a selection of gluten-free treats. Be sure to check out the beautiful holiday gift packages! While we might not be able to get to Southampton to visit Tate’s quaint bakery, we can certainly enjoy the bounty of Kathleen King’s baked goods. Do you start thinking about the holidays as soon as the weather gets cool? As magazines and store displays tempt us with holiday decor and goodies,we start thinking about our own plans. Candy is always part of the plan — a big part. Karen makes her pecan pralines, and I make caramel pecan turtles, but sometimes gift lists run long and time runs short. This year, I’m looking for quality candies to help round out gift bags and for holiday gatherings. I recently found a bag of Koppers milk and dark chocolate sea salt caramels in a specialty shop, and of course, it called my name. These candies are a real treat. The caramel strikes the perfect balance of creamy chewiness, the sea salt counters the sweetness of the caramel. and yummy, creamy chocolate covers it all. Kudos to Koppers for pleasing both milk chocolate and dark chocolate fans in a single package! The chocolate sea salt caramels would be great for a dessert buffet, in a gourmet gift basket, or as a simple stocking stuffer. Koppers Chocolate was founded in 1937 in Greenwich Village, New York. Seventy-five years and three generations later, the company is still family owned and operated. They pride themselves on combining the best of old world quality and modern techniques, and are recognized as innovators in the industry. I was very surprised to learn they were the first to manufacture small disks of chocolate covered in colorful candy shells – the predecessors to M&Ms! They started drenching espresso beans in chocolate more than 40 years ago. 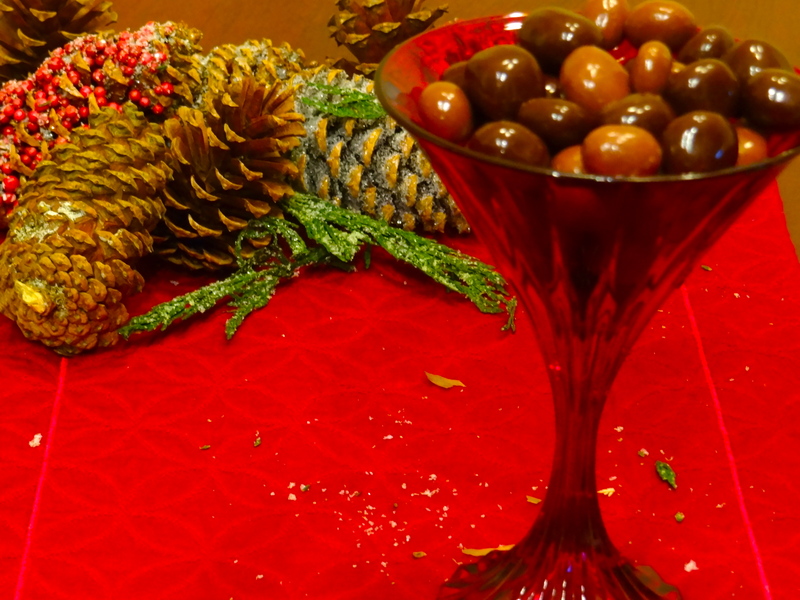 Their current incredible array of chocolates includes such unusual selections as chocolate covered pink peppercorns and eggnog cordials. Be sure to check out CNN Money’s report on this historic American candy company on Koppers website. Koppers offers some of their most popular candies on their website, and there is an even wider selection available on Amazon, although many selections are available only in 5 or 10-pound bags. That might not be such a bad thing! Koppers also customizes candies for weddings and other events. Footnote: As I did a final review of this post, we were watching news reports of Hurricane Sandy moving into the New York area. I started to reschedule the post since Koppers is located in New York City, but decided to publish it as planned. Koppers and many other artisan, specialty and gourmet food producers in the path of the storm could be facing some big challenges just as the busy holiday season begins. Power outages can cause loss of perishable inventories, flooding can damage or destroy facilities and equipment, and employees who face their own personal and family challenges may not be able to focus on their jobs. Food businesses that can resume operations quickly after the storm may face reduced demand from customers in their immediate areas. Please support food artisans in the northeastern seaboard area this holiday season. Allen and I decided to mark the demise of our less-than-desirable backyard landscape by grilling burgers one la st time before the landscape crew arrived and the rehabilitation chaos ensued. Allen has his own secret blend of spices for hamburgers, but we decided to give J-Burger Chipotle & Onion Seasoning a try. The first key to juicy burgers is choosing the right meat, so pass up the ground sirloin, ground round, and super-lean ground beef. The best burgers are made from freshly ground beef with at least 20% fat. Avoid previously frozen ground beef if you can. Adding the J-Burger Seasoning could not have been easier. We gently mixed about three tablespoons of the seasoning sauce with one pound of ground beef. Don’t overwork the meat, and form it lightly into patties. Press a small indention in the center of each patty with your thumb so the outside edges are slightly thicker than the center. Grill to an internal temperature of at least 160° F, or more as you like. Our burgers were outstanding. The smoky warmth of the chipotle peppers was nicely balanced with sweet onion, and the burgers were very moist and tender. A slice of pepper jack cheese was the perfect finishing touch. 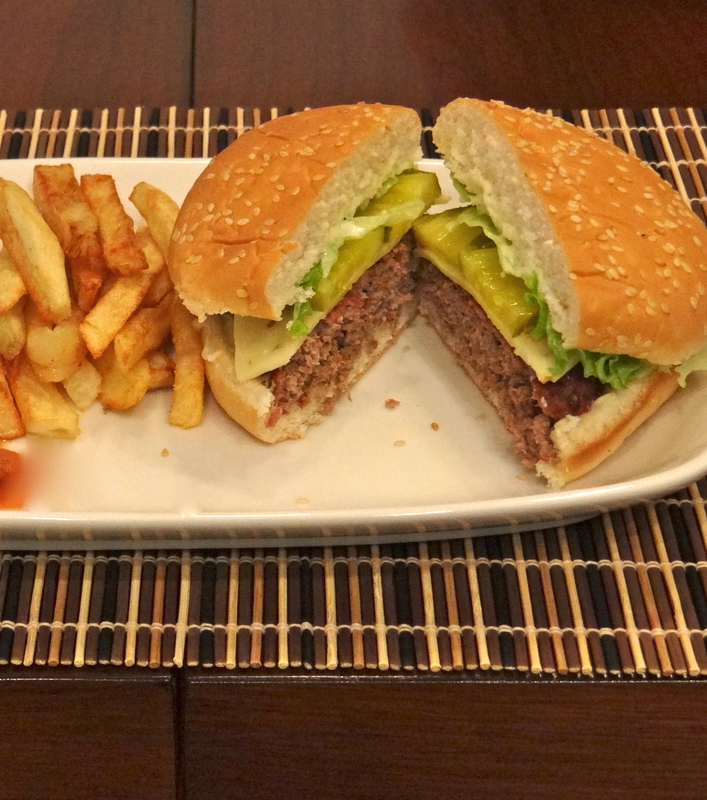 J-Burger Seasonings were created in a home kitchen by burger lovers who were weary of dry spices. Like many artisans who create something spectacular, they found themselves making burgers for friends and family, and sending them home with jars of the seasoning sauce. The next logical step was to make the seasoning available commercially. 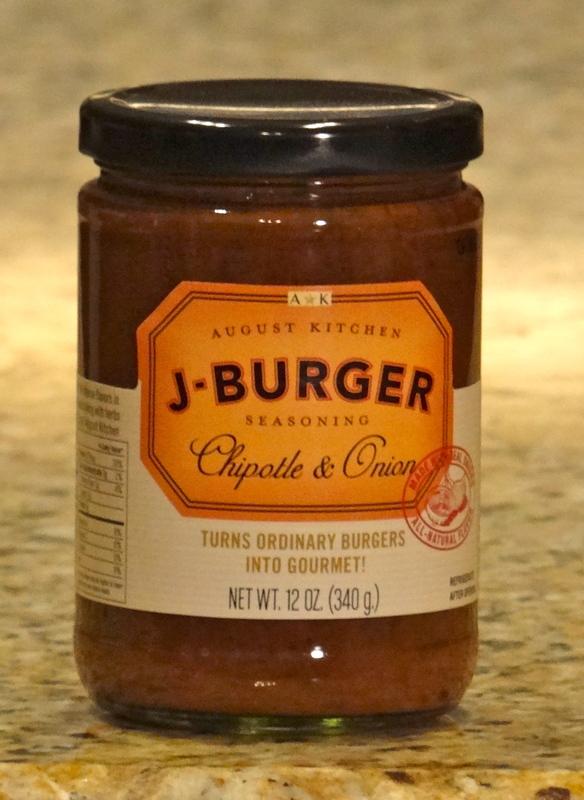 J-Burger Seasonings are produced by August Kitchens in Armonk, New York. Their website has a complete list of retail and online sources for their products. We found J-Burger Chipotle & Onion Seasoning fantastic in meat loaf, too. Instead of pulling a half-dozen spices out of the pantry, I used a quarter-cup of the seasoning sauce and about one-third cup of seasoned dry bread crumbs to a pound of lean ground beef. The meat loaf was formed and in the oven in less than 5 minutes. What a time-saver! After about 55 minutes in a 350° F oven, I added grated cheddar cheese on top and baked another 5 minutes. It tasted amazing!